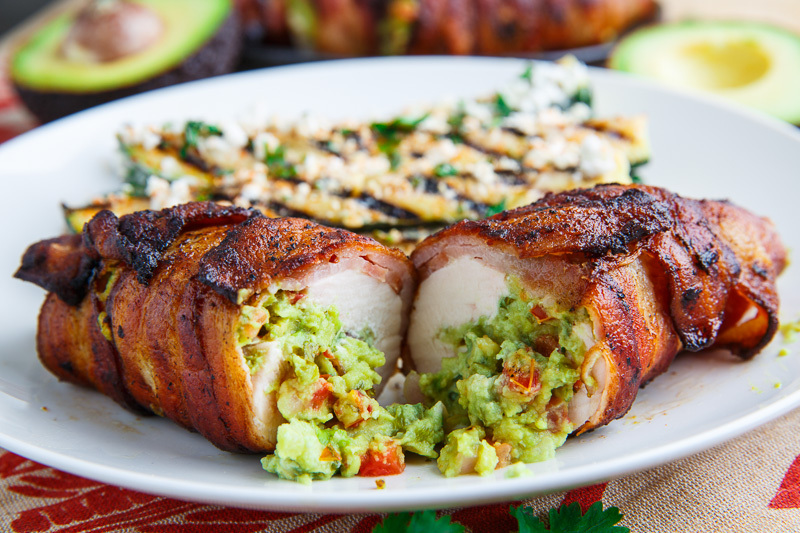 Tender chicken breast stuffed with creamy guacamole and wrapped in bacon that’s grilled until the bacon is nice and crispy! 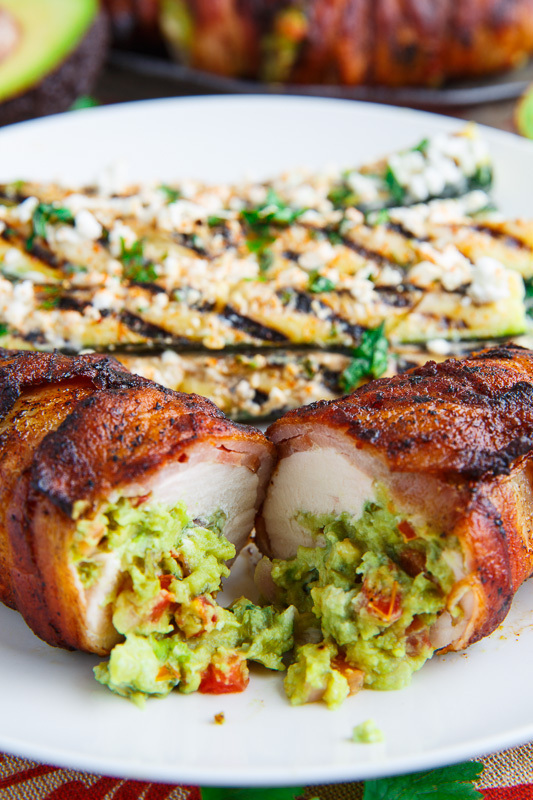 It’s time to pull your grills out and celebrate summer by making these bacon wrapped guacamole stuffed chicken breasts! 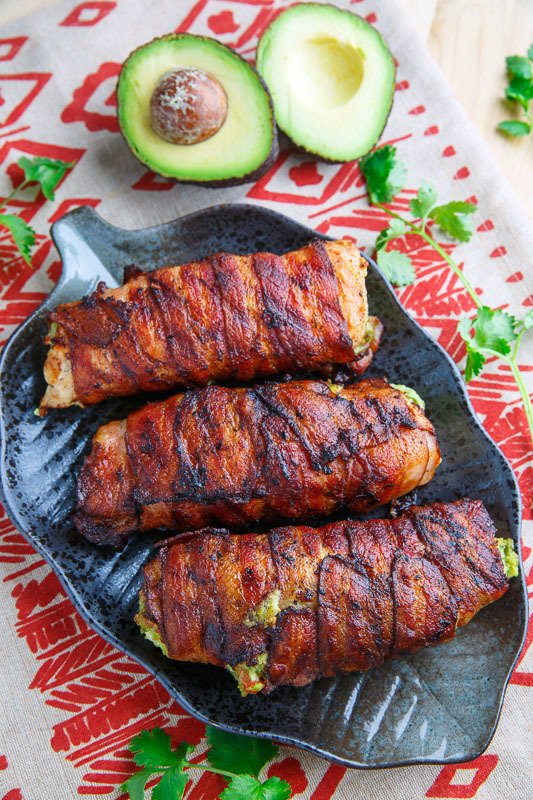 I took two of my favourite foods, bacon and avocado and combined them into a tasty dinner that is just begging to be grilled! Although this recipe might look a little challenging with the stuffing and the wrapping, it’s actually pretty easy! You start off by pounding the chicken breasts until they are about 1/4 inch thick with a meat mallet (I have used a rolling pin to do this) and then you just place the guacamole on top of one side and roll it up. You can either wrap the bacon around the chicken one slice at a time to ensure a single layer of bacon or you can just lay a few strips of bacon out, place the chicken on one end and wrap it all up in one go. The essential thing about this recipe is to get the bacon nice and crispy and this is easy on the grill but if you are stuck indoors you can either pan fry the wrapped chicken and then place it in the oven or you can cook it in the oven and then turn the oven up to broil. 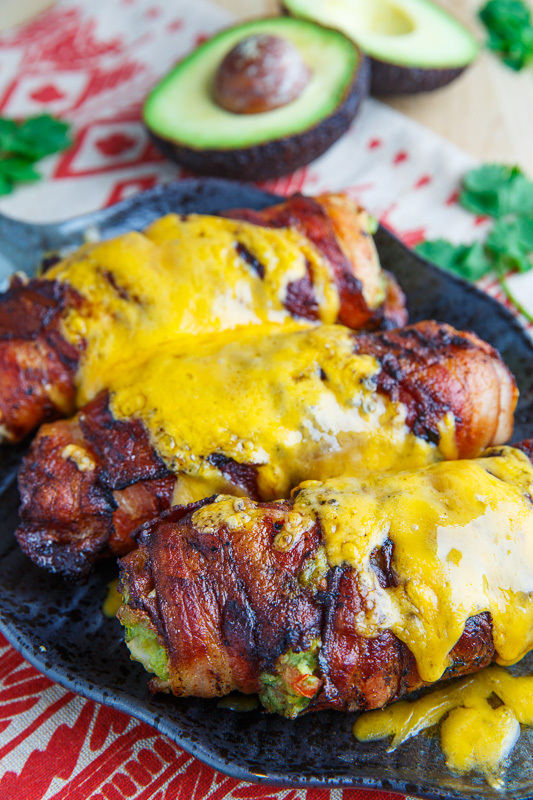 No matter how you do it this bacon wrapped guacamole stuffed chicken is sure to be the talk of the town! #CelebrateCanada this summer with @WeberGrillsCA by getting outdoors and grilling! I know what you are thinking right now: “But Kevin, this meal only includes two of the three major food groups; you’ve got the bacon and avocado but where is the cheese?” Well, I’ve got you covered, or rather I got these tasty bacon wrapped guacamole stuffed chicken breasts covered, in plenty of cheese and then placed back on the grill until it melts! Grill over indirect medium heat, with the lid down, until the bacon is crispy and the chicken is cooked (160F to 165F), about 20-30 minutes, or bake in a preheated 400F/200C oven on a wire rack on a baking pan until cooked, about 20-30 minutes, turning the oven to broil for the last few minutes to ensure that the bacon is crispy. Option: Replace the salt and pepper with your favourite seasoning blend. Option: Add flavours to the guacamole like sundried tomatoes or blue cheese, etc. This is a sponsored post written by me on behalf of Weber Grills Canada. All opinions are 100% mine. 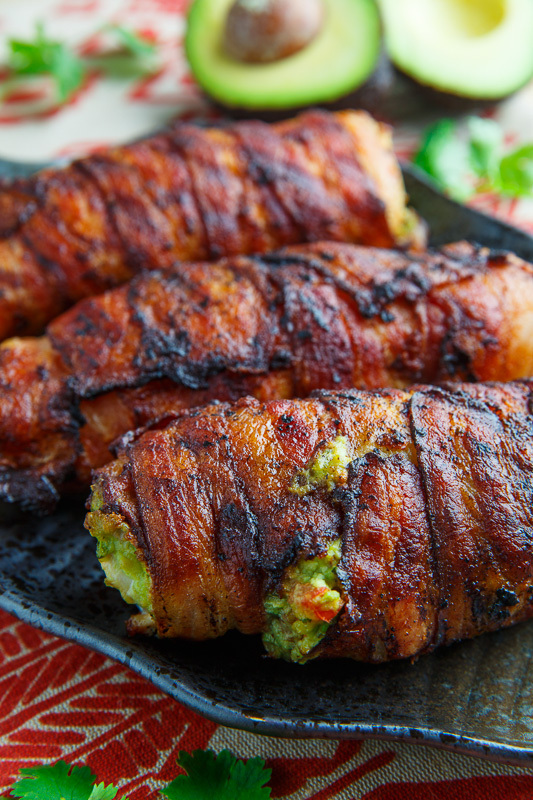 Anything bacon wrapped is heavenly!! Wow!! Now this is my kind of chicken dinner 🙂 Love! This is my kind of grilled chicken! That guacamole… and that melty CHEESE on top! Love! Pinned! All of my favorite ingredients here!! Well done Kevin! This is basically everything good in life. HEAVENLY! Anonymous: I laid several strips of bacon out on a surface with a little overlap between each slice, placed the chicken on one and and rolled everything up. After that I made sure that the side with the loose ends of the bacon were down on the grill so they cooked onto the next layer down nice and solidly. I am on board with this!! What more could you ask for! Clearly this is a good decision. Does your avocado not go bitter? I've cooked with avocado on pizza before and it just gets this bitter taste when cooked. Not sure if the same would happen here? Anonymous: There is no bitterness to the avocado in the guacamole in this. 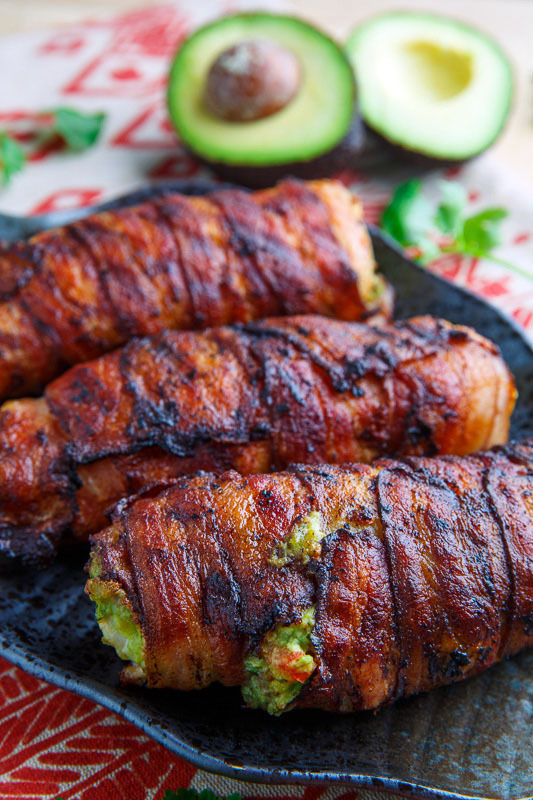 I have always had the same problem Anon reported about bacon-wrapped anything refusing to stay rolled on the grill. Then I realized the problem was that my favorite bacon –thick sliced–is too thick to stay wrapped and too thick to "weld together" as Kevin described. Thin works better, tho it cooks too quickly if fire is too hot. This looks incredible all rolled up…happy feasting! Kevin, how can I email this to myself & my sister? This is a must-do recipe. Use wooden toothpicks or skewers and don't overfill the chicken breast! We had this for dinner tonight. It was great!! A keeper! Jodi Ferro: I'm glad you enjoyed it! Do this without the guac. Guac cooked is revolting. Revolting….to you. Why be so cutting with your words? I made this for my family (including 2 pre-teens). I have to say I was a little concerned about cooking the guacamole, but it was just fine – as if it hadn't been in the oven for almost 30 minutes!. I pounded the breasts thin and carefully rolled them jelly-roll style. I also used 4 strips of bacon per breast: one wrapped lengthwise across the "chicken seam" and the ends and the other three wrapped as instructed. Doing this circumvented any need for toothpicks as the bacon created a fine "envelope." When wrapping, I made sure that the "chicken seam" was UP while the "bacon seam" was DOWN during the baking/broiling. Pretty darn easy, too. This recipe is a keeper. Will definitely be trying this one. I am going to mix finely shredded mozzarella with my guacamole before spreading that mixture on chicken breasts. I like my cheese melted and stringey…..not charbroiled. Keep those tasty recipes coming!! !